Grease complex lithium high performance for high temperature applications. Designed to reduce the frequency of re-lubrication up to 80% with respect to the fat lithic conventional. - Mechanical elements, working at high temperature. - Bearing and flat bearing. - Cams, guides and elements of slow slip that require a large adhesion at a high temperature. Fat complex of lithium for high-temperature applications. Specially designed to reduce the frequency of re-lubrication up to 80% with respect to the fat lithic conventional. - High protection and long service life, even in very aggressive environments. −Service temperature of -20ºC to +160ºC, with tips 180 ° C (in static or low speed). −Superior anti-Wear protection, excellent Extreme Pressure (EP). − The technology of the thickener complex allows the grease attached to the rolling elements remain fluid, while the rest form a “screen” protector preventing the action of external contaminants (dust, moisture, etc). 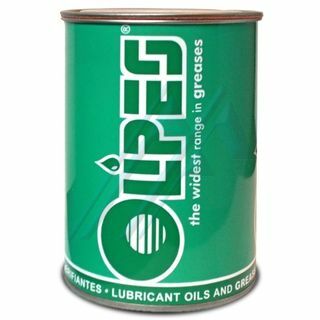 − Its advanced formulation also prevents the hardening suffered by conventional greases. − Resistant to oxidation, stable to shearing, protection against corrosion and wear. - Stable against the mechanical work and vibration, even in the presence of contamination by water. - Transport vehicles (Fleets, Public Works, Mining ...) for their excellent performance on hubs, wheels, electric brakes..., it allows more than 100,000 Km. without regreasable. - Mechanical parts operating at high temperature. Cartridges of 400 g, Containers of 5 lt and 20 lt, jerry Cans of 50 litres and 200 litres.